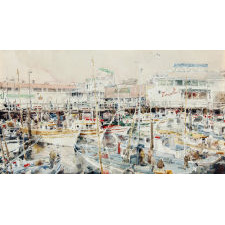 Framed watercolor abstraction on paper of floating houses by Varujan Boghosian (born 1926; Watercolor abstraction of floating houses by Varujan Boghosian dated 1955. 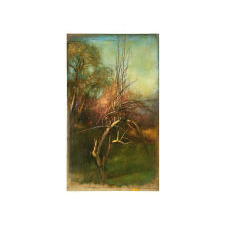 Probably in a frame made by the artist early in his career with an old label of Carl Siembab's Galle..
Oil on board of the General Israel Putnam home in Danvers,MA by Jose Enrique Guerreo (1905-1986); Jose Enrique Guerreo (1905-1986) Ecuadorian painter, born in Quito in 1905. 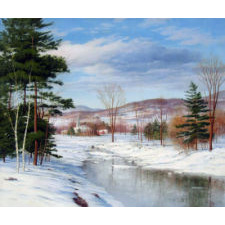 As a young man, he studied at the School of Belle Arts in Quito and became friends with Harol..
Large oil on canvas landscape of Winter Logging in NH by James King Bonnar in period hand carved frame. ; Large oil on canvas Cape Anne and Rockport school painting of hauling logs in the White Mountains by James King Bonnar (1883/85-1961) in original hand carved and gilded period..
On the Coast; Excellent condition with no restoration. 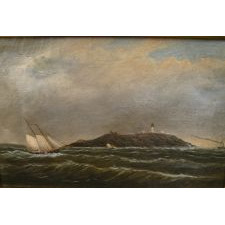 Signed Oil on canvas Painting of Seguin Light, Maine by C. Drew; "Seguin Light Mouth of the Kennebec River by C. Drew 1887" signed and titled,as usual on the back, in period frame. Two very small patched and inpainted areas in the sk.. Portrait of a Boy in a Red Dress; Portrait of a Young Boy in a Red Dress Prior-Hamblin School, Probably George G. Hartwell (1815-1901), Massachusetts, circa 1845 Oil on canvas, 27 1/4" x 22", in a 19th century.. Offered by: Olde Hope Antiques, Inc.
Large oil on wooden panel of garden vegetables by Samuel Lancaster Gerry. 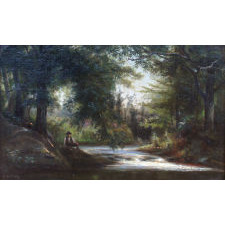 American (1839-1891); This large oil on wood panel was purchased by me from direct descendants of the artist and it had never been out of the family. It was given to one of his two nieces. I ..
GURDON TRUMBULL (1841-1903); Still Life of DaisiesLabel of verso, Gurdon Trumbull, c. 1865Oil on academy board Gurdon Trumbull, born in Stonington, Connecticut, was trained by landscape painters in Hartfo..
PAUL LACROIX (1827-1869); Still Life with MumsSigned and dated Lacroix, N.Y. 65, 1865Oil on boardCondition: (see full condition report)Source: Godel & Co., New York City, New York Paul LaCroix..
ALEXANDER T. VAN LAER (1857-1920); LandscapeSigned lower right A.T. Van Laer, c. 1890-1900Oil on canvasSource: The Cooley Gallery, Old Lyme, ConnecticutIllustrated in Ann Y. Smith, Alexander Theobald Van L..
JOHN FREDERICK KENSETT (1816-1872); View from NarragansettEstate stamp on versoOil on canvas laid on boardCondition: (see full condition report)Source: Christie’s Auction, New York City, New York, May 25, ..
JOHN CASILEAR (1811-1893); Housatonic River Scene, Cornwall, ConnecticutSigned with monogram, dated lower right, 1860Oil on canvasCondition: (see full condition report)Source: Litchfield Auction Gallery..
WILLIAM SONNTAG, SR. (1822-1900); SunsetSigned lower left, Sonntag, c. 1860Oil on canvasSource: Michael A. Latragna Fine Art, Rochester, New YorkPublished in Nancy Dustin Wall Moure, William Louis Sonntag,Arti.. 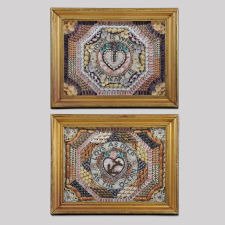 EXCEPTIONAL PAIR OF SAILOR�S VALENTINES; Love As Deep As The Ocean and Home Is Where The Heart IsBarbados, late 19th centuryShells arranged in shadow boxes with gilt frames.Condition: Excellent, minor imper..
ALEXANDER T. VAN LAER (1857-1920); Autumn LandscapeSigned lower right A.T. Van Laer, c. 1890-1900Oil on canvasSource: The Cooley Gallery, Old Lyme, ConnecticutIllustrated in Ann Y. Smith, Alexander Th..
Edward Nichols (1819-1871); View of Lake WaramaugSigned, inscribed on verso, c. 1855Oil on canvas12” x 18½”Condition: (see full condition report)Source: Spanierman Gallery, New York Ci.. Still Life; Important size, Fruits, baskets, compote,table, etc. oil on canvas, all original, no in-painting, frame / stretcher, original and untouched. Beautiful condition, a..
West From Bear Cliff; Oil on Panel. Portrait of a Young Boy on a Striped Carpet: �Theodore Talbot�; Portrait of a Young Boy on a Striped Carpet - "Theodore Talbot" Artist Unknown, New York State; Indistinctly initialed "LR" on baseboard Watercolor on paper, 8 ½&..
Coastal Scene by Walter Baum; Pennsylvania, 1884-1956. Oil on Board. 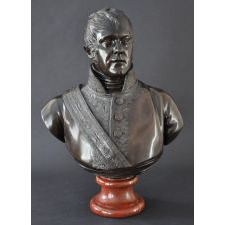 Sala Bosworth (1805-1890) American; Portrait of Captain William Walker Unsigned, ca. 1835-1840. Oil on canvas. In a period gilt frame Condition: Excellent. (See full condition report.) Sala Bosworth was a.. 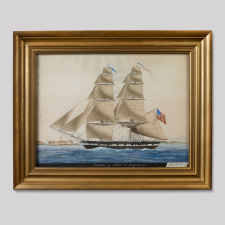 Portrait of a Schooner with American Flag; Artist Unidentified, AmericanMid-19th centuryOil on panel in a cove molded frame which appears original.Condition: Untouched original condition, minor abrasions.14 3/4" x 18 3.. 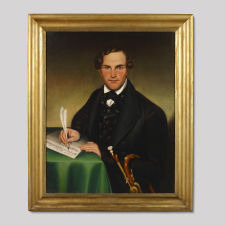 Portrait of a Gentleman Holding a Horn While Writing Music; Signed and dated (l.l): W.W. Wheelock 1841Inscribed on verso: W.W. Wheelock, pinxt, Nov. 2, 1841 New YorkOil on canvasAppears to be original frameA wonderful compostition capt..
"Full Length Portrait of a Young Girl Wearing a Pink Dress, Red Coral Necklace and Holding Flowers in a Landscape View"; American School, Probably New York State.Ca. 1840.Oil on canvas.42" x 30"; 49" x 37 1/4" framed.Condition: Fine condition.This charming portrait situated in a landscape has ma..
"Locomotive 'Lexington' "; "Rhode Island. Locomotive. Works. Providence, R.I. 1871"Drawn by T. F. RamsayWatercolor, oil, gilt paint and pencil on paper mounted on board18 1/2" x 26 1/2"Condition: Excell..
"Portrait of a Woman Wearing a Tortoise Shell Comb Seated in a Chair Holding a Book by 'Chapone' "; Unsigned. New England, ca. 1830. Oil on canvas, period gilt frame.Condition: Excellent, minor imperfections.The elegant looking woman wearing fashionable attire is seated and ..
"Thomas Sedgewick Steele (1845-1903) American, active/lived Massachusetts"; Still Life of Oysters, Mug of Beer, Lemons & Pretzels Arranged on a TableSigned (l.r. ): "T.S. Steele"Oil on canvas19 1/4" x 18" framedCondition: Oil on canvas laid down on..
Ammi Phillips (American, 1788-1865); Portrait of a Gentleman Seated in a Painted Chair Holding a Book Probably New York, ca. 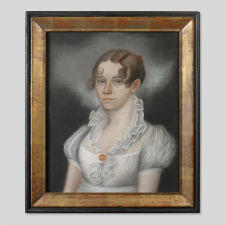 1836-1840.Oil on canvas36 1/2" x 31 1/2"Condition: Lined, scattered in-painting in back..
William MS Doyle (1769-1828) American, Lived/Active Boston area, Massachusetts; Portrait of a Young Woman in a White Dress with Ruffled Collar.Attributed to William Doyle.Ca. 1800-1820.Pastel on paper.29" x 25" framed.Provenance: Private Collection, Cape ..
Howard B. Helmick (1845-1907) American; The Idle BoySigned at lower right: "H.B Helmick"Inscribed in pencil on former mount: "H Helmick/The Idle Boy"Oil on paper7" x 5"Exhibited: Great Central Fair, Philadelphia (18..
Isaac Eugene Craig (1830-1912) American ; In ChurchInscsribed in ink on verso: In Church/I. Eugene Craig__Inscribed in pencil on former mount: Eugene Craig/In ChurchOil on paper7" x 4 1/2"Exhibited: Great Central Fair..
American Folk Painting of a Regatta on Lake Seneca, New York; American School.Painted by Rev. Henry W. Parker from Aurora, New York, 1848. The larger schooner is the "Peterford Nymph". Oil on canvas 20 1/2" x 29 3/4" framed Excellent con.. Artist Unidentified American, probably New York, ca. 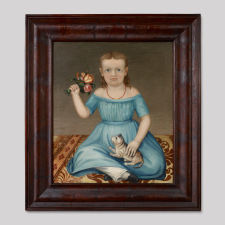 1830-1845; Portrait of a Young Girl Holding a Bouquet of Flowers and a CatOil on canvas, original mahogany veneer frame28”h x 24”w; 38” x 33 ¾” framedCondi..
Charles Peale Polk (1767-1822) American; Maryland, New York, Pennsylvania; Portrait of Mrs. Jacob Ten Broeck and Daughter. Inscribed on verso: R.H.P. and a label: Mrs. Jacob Ten Broeck and Daughter of Albany. Painted ca. 1787-1790. 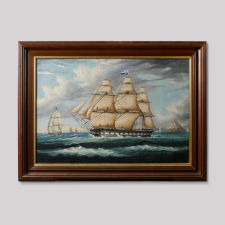 Oil on canvas 39 &..
Thomas Chambers (1808-1869) American, active New York/New England; Packet Ship with other Vessels Unsigned, ca. 1840-1850. Oil on canvas 27 ½” x 37” framed Condition: Fine condition. See full condition report. This example,.. The Morgan Orr & Company Foundry Buildings Philadelphia, Circa 1865; Unknown artistOil on canvasPeriod gilt frameH: 19"; W: 22" Provenance: From the estate of George Gallup, Princeton, NJ The Morgan Orr & Company was an iron foundry .. Still Life with Peaches William Mason Brown (1828-1898); Oil on canvasOriginal carved and gilt frameH: 20"; W: 24.25" William Mason Brown (1828-1898) was a second generation Hudson River School artist but later gained fame for his m..
Pear Tree I; Stephen Brown (1950-2009) A sensitive portrait of a compelling pear tree built from layer and layer of thin oil glazes and washes.Condition: Excellent. Archivally frame.. Bronze Bird's Nest; Homer Gunn (1919-2001) Modernist sculpture with great textures from the intertwined bronze nest, the faux tree stump and the square eggs.Gunn (1919-2001) was born in Wo..
Ship "Leander" of Salem at Smyrna. 1831; Artist unknown, AmericanWatercolor on paper, in a period frame.22" x 27 1/2" framed.The Brig Ship Leander was 223 tons, built in 1821, Salem, Massachusetts and owned by Joseph..
Aaron Siskind (1903-1991) - The Tree; Strong image of a famous Martha's Vineyard landmark. Silver Gelatin Print. Martha’s Vineyard, North Tilbury, MA 1974. 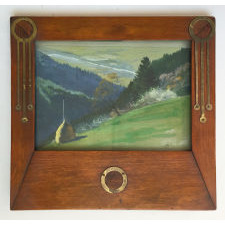 Archivally mounted in a dark stained waln..
Arts and Crafts Frame; Wonderful small desk frame (with easel back). Maple with brass inlaid circle and tendrils. Houses a nice watercolor of a hilly landscape (not sure of age or origin of the..
Full-Length Portrait of a Young Boy with his Dog Seated in Front of a Landscape View; American, probably New York State Unidentified artist, ca. 1830-1845. Oil on poplar panel. 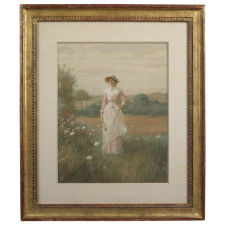 42 3/4" h x 32 1/2" Condition: Few Minor shrinkage cracks to panel, very minor scatt..
Frederick Dielman (1847-1937); "Young Woman in a Field of Flowers" Signed, (l.l. ), "1899" Watercolor with touches of Chinese White 15 3/4" x 12" Excellent condition Provenance: Ex Hirschl and Adler Gallery ..
A Large American Still Life Painting by Severin Roesen and his Studio. ; Still Life with Fruit on a Platter, Severin Roesen & Roesen Studio, New York, Circa 1850 Dimensions: Frame: 35 3/4 inches x 49 inches; Picture sight: 25 3/4 inches .. Offered by: Earle D. Vandekar of Knightsbridge, Inc. 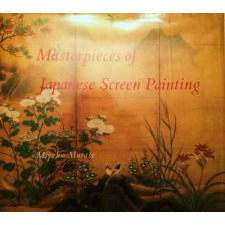 Masterpieces of Japanese Screen Painting; Masterpieces of Japanese Screen Painting: The American Collections by Miyeko Murase. This oversized hardcover book with dust jacket has 231 pp and features 37+ stunning ..
Renaissance Marble Carving of Moses; An unusually sensitive Renaissance marble carving of Moses. Charles Edouard DuBois American 1847-1885; View from Cap Martin, MentonSigned (l.l.) C. E. DuBoisOil on canvas43 ¾" x 67 ½" unframedCondition: Excellent condition. 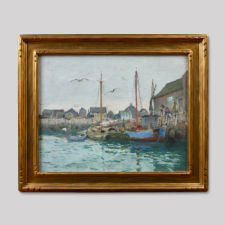 Recently cleaned with condition report b..
Mathias J. Alten (1871-1938) American; Rockport Harbor, Massachusetts, 1931 Oil on canvas In the original carved gilt frame Condition: Excellent condition Inscribed on verso in pencil: "Included in: A Catalogue Rai..
Child's Size Bentwood Armchair; New York, probably Adirondack region, 1870-1890.Bentwood saplings, probably ash or maple.Excellent condition, retaining original red paint finish.Rustic bentwood furniture was.. Portrait of the Paddle-Wheel Ship, Penobscot; Bangor, Maine, ca. 1875.Bears, Frost & Adams Boston label on verso of stretcherOil on canvas17" X 23" Condition: Excellent, in a period gilt frame. 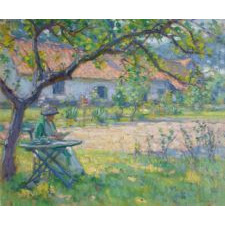 Portrait of a Gentleman Writing a Letter; English School, ca. 1790-1810.Unidentified artist, indistinct monogram (l.r. 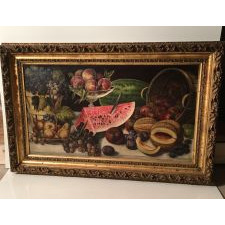 ).Oil on canvasCondition: Lined on original stretcher, minor scattered in-painting, stable craquelu..
American School, Artist unidentified, last quarter of the late 19th c.; Still Life of Fruit in a Compote with Cake. Oil on slate stone. In a period gilt frame. Excellent condition, untouched. Provenance: Private collection, Connecticut. The work i..
Large Brewery Painting; Large and colorful painting of a festival outside the walls of a brewery. Highly detailed with many whimsical scenes. Ex. Milwaukee Art Museum. Offered by: The Cooley Gallery, Inc.
Johann Mongels Culverhouse (1820-1891) Lived/Active: New York, The Netherlands; Street Market Under the MoonlightSigned and dated (l.l. ): TM Culverhouse '67Oil on canvasCondition: Lined, minor areas of restoration. In a period gilt frame. Henry Loos, active 1870-1904, Belgium/American School; Masted Ship, Alexander Gibson.Signed, (l.r.) Henry Loos, dated 1879.Oil on canvas. In a black painted, gilt frame.Lined, fine condition, very minor scattered in-painting. Prov.. Attributed to Mary E. Yorke; Portrait of the Sloop Yacht Defyer Sailing in New York BayUnsigned, New York, late 19th c.Oil on canvas, orignal carved gilt and gesso shadow-box frame.Condition: Excelle..
American School, Artist unidentified, last quarter of the late 19th c.; Still Life of Fruit in a Compote with Cake.Oil on slate stone. In a period gilt frame.Excellent condition, untouched. The work is prepared on a rare and impressive large-size ..
Watercolor Portrait; Portrait of a woman, painted in watercolor on paper and highly stylized in form. The shape of her skirt and the entire outline of her body is elegant and dramatic for an.. 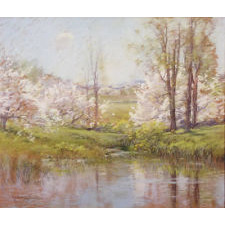 Offered by: Peter H. Eaton Antiques, Inc.
Wolomolopog Pond, Sharon, Massachusetts; Titled, signed and dated on the reverse. Period gold frame. 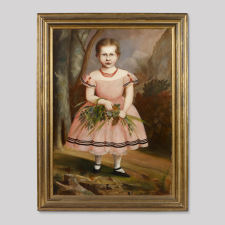 Lady in a Blue Dress; Oil on canvas, reproduction gold frame. 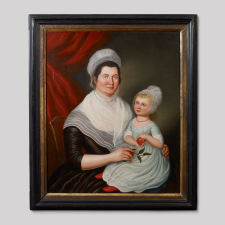 Benjamin Greenleaf (1769-1821) American, Lived/Active: Massachusetts, New Hampshire; Portrait of Mrs. Nancy Wyman-HoughtonUnsigned, ca. 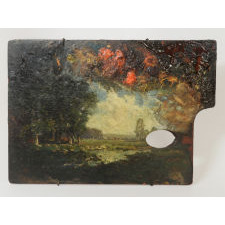 1810-1815.Reverse painting on glass19 1/2" x 14 1/2" framedCondition: Some lifting of paint on glass, some paint loss althou.. Paint Decorated Blanket Chest; Schoharie or Albany County, New York, ca. 1815-1830.Pine, paint decorated, iron hinges.Condition: Minor imperfections such as abrasions with very minor in-painting. The blanke.. Portrait of a Man by Brewster; Oil on canvas on the original stretcher in a period frame. The man is identified on stretcher as "Doct. Lloyd Hixon, Lowell, Mass". 19th Century Russian Painting. Winter Scene. Oil on Canvas. 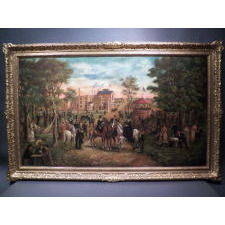 Unsigned; Excellent quality 19th century Russian oil painting on canvas. 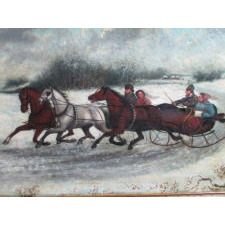 Winter scene depicting two horse drawn sleighs driven by pair of couples through the countryside. Painting has a..
Allen Russell Saalburg (1899-1987); Rare Three Panel ScreenSigned (l.r. ): "Allen Saalburg" ca. 1930Active Pennsylvania and New YorkOil oncanvas, backed with linen66"h (center), 72" wCondition: Excellent conditio.. Early Ink Miniature on Paper; Highly skilled ink miniature on paper of woman in bonnet. Profile work showing a beautiful woman in her best bonnet and sprig decorated dress. Closely stipples background appe..
Asahel Lynde Powers (1813-43); A bold, yet sensitive early folk art portrait of a young man sitting in a decorated chair by Asahel Powers.Oil on poplar panel in distinctive original frame.Very min.. Portrait of John McClellan as a West Point Cadet; Striking oil on canvas portrait of John McClellan (1805-54) as a West Point cadet upon his graduation in 1826; in upper left, military encampment with American flag.McClellan ..
Pocahontas and John Smith. Chromo-Lithograph. Dated 1870. Rare. ; "Pocahontas Saving The Life of Captain John Smith" is a chromo-lithograph made by the "New Eng. Chromo Lith. Co. Boston" (printed on the lower left border). 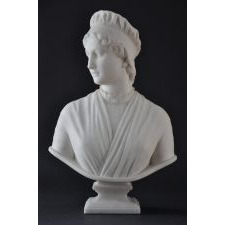 It is dated 1870. ..
"Mountain Desert Trail" John Hauser (1859-1913) Gouache on Paper; Dated 1896 and signed lower right this John Hauser painting is so popular that it has been reproduced in several mediums over the last 100 years, but this is the original. It .. Attributed to William Buss (English, 1804-1875); The Enthusiastic Sportsman oil on canvas Condition: Fine condition, very minor scattered in-painting recently cleaned by Tom Yost. In a period gilt frame. 10 x 11 ½ inc..
George Emmanuel Opitz Born in Prague in 1775, died in Leipzig in 1841; Un Planteur dans les Indes Occidentales (A Planter in the West Indies) Initialed and dated (l.l. 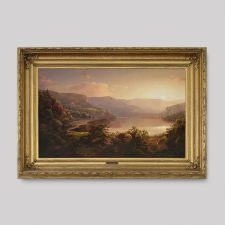 ): P/12 Watercolor on paper 19" x 15" George Emmanuel Opitz was born in Prague ..
Charles W. Knapp American (1823-1900); "View on the Susquehanna River, 1872" Signed (l.l. ): "C W Knapp" Oil on canvas 29" x 45" framed Provenance: Richard York Gallery, New York; private collection, California Char..
Hawaiian Ai-Laiki = Ricebird - James W. Washington, Jr.; A striking, signature work carved from black granite— the bird is powerfully rendered with a commanding posture. James W. Washington, Jr. was an African-American folk ar..
Bird Family - James W. Washington, Jr.; Bird Family is a large work of a mother bird protecting and feeding three nestlings under her wing. The solid black granite metaphorically reinforces the strength of the matri..
Bridge Dividing Kennebec River - George E. Morgan; Signed and dated on verso: George E. Morgan, July 1963. 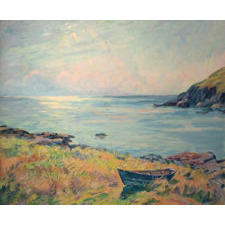 Select Exhibitions: Farnsworth Art Museum, Rockland, ME, "George E. Morgan: Self Taught Painter of Maine" July 16 - Oct..